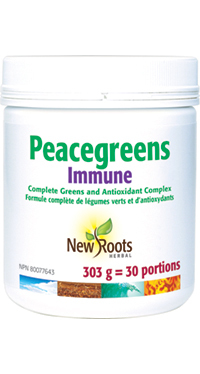 Peacegreens Immune is packed with a full spectrum of antioxidant and energy-boosting greens. It also contains 53 premium nutrients that cleanse, increase vitality, and strengthen the immune system. These days, it is hard to get all the vitamins, minerals, nutrients, and energy we need to keep our busy lives going. Our ultimate greens formula Peacegreens Immune combines 53 high-quality ingredients providing enzymes, vitamins, probiotics, minerals, essential amino acids, vegetable proteins, antioxidants, phytonutrients, fibre, chlorophyll, phytosterols, resveratrol, and astaxanthin in a base of vegetable enzymes. These ingredients are synergistically balanced to nourish the organism, promote cleansing and internal detoxification, offer powerful antioxidant protection, increase vitality, and enhance the immune system. One serving of Peacegreens Immune provides the equivalent nutrients of eating over six green salads. It will restore your body back to a healthy pH of 7. The unhealthy “acidic” body you had before will change to a healthy alkaline body. Adults: Take 3½ teaspoons (10.1 g) daily on an empty stomach or 15 minutes before a meal, or as directed by your health-care practitioner. Take with plenty of water (4–6 glasses). If you are taking antibiotics, take this product at least 2–3 hours before or after them. Consult a health-care practitioner for use beyond 1 month. Probiotics — 10 billion CFU, provided by the following strains: Lactobacillus rhamnosus R0011 (4 billion CFU), Lactobacillus rhamnosus R1039 (3 billion CFU), Lactobacillus acidophilus R0418 (550 million CFU), Lactobacillus helveticus R0052 (500 million CFU), Lactobacillus casei R0215 (400 million CFU), Lactobacillus plantarum R1012 (400 million CFU), Bifidobacterium breve R0070 (300 million CFU), Bifidobacterium longum ssp. infantis R0033 (300 million CFU), Bifidobacterium longum ssp. longum R0175 (300 million CFU), Streptococcus salivarius ssp. thermophilus R0083 (200 million CFU), Lactobacillus delbrueckii ssp. bulgaricus R9001 (50 million CFU). Digestive enzymes (8 mg) — alpha-amylase (314.987 FCC alpha-amylase dextrinizing units), bromelain (from pineapple [Ananas comosus var. comosus] stem) (19,200 FCC PU), cellulase (33.6 FCC cellulase units), dipeptidyl-peptidase IV (55 FCC HUT), alpha-galactosidase (0.506 FCC alpha-galactosidase dextrinizing units), glucoamylase (1.333 FCC AGU), hemicellulase (0.888 FCC HCU), invertase (2.133 FCC INVU), lactase (14.507 FCC ALU), lipase (80 FCC LU), maltase (3.467 FCC DP), papain (from papaya [Carica papaya] fruit) (8000 FCC PU), pectinase (1.6 FCC endo‑PGU), phytase (0.067 FCC FTU), protease I (1104.987 FCC HUT), protease II (196.8 FCC HUT), protease III (1.52 FCC SAP). Also contains (quantity per 3½ teaspoons): Apple (Pyrus malus) fruit pectin (1033 mg), acerola (Malpighia glabra) fruit extract (115 mg), broccoli (Brassica oleracea Italica) extract (38 mg), arabinogalactan, inulin, potato starch, stevia (Stevia rebaudiana) leaf, vitamin C (ascorbic acid), and vegetable magnesium stearate.